Good morning Legionnaires and veterans advocates, today is Wednesday, April 17, 2019 which is Holy Wednesday, Ellis Island Family History Day, National Kickball Day and Blah, Blah, Blah Day. 1970: With the world anxiously watching, Apollo 13, a U.S. lunar spacecraft that suffered a severe malfunction on its journey to the moon, safely returns to Earth. On April 11, the third manned lunar landing mission was launched from Cape Canaveral, Florida, carrying astronauts James A. Lovell, John L. Swigert, and Fred W. Haise. The mission was headed for a landing on the Fra Mauro highlands of the moon. However, two days into the mission, disaster struck 200,000 miles from Earth when oxygen tank No. 2 blew up in the spacecraft. Swigert reported to mission control on Earth, “Houston, we’ve had a problem here,” and it was discovered that the normal supply of oxygen, electricity, light, and water had been disrupted. The landing mission was aborted, and the astronauts and controllers on Earth scrambled to come up with emergency procedures. The crippled spacecraft continued to the moon, circled it, and began a long, cold journey back to Earth. President John F. Kennedy waits for word on the success of a covert plan to overthrow Cuba’s government on this day in 1961. Kennedy had authorized Operation Zapata, the attempt to overthrow Cuba’s communist leader, Fidel Castro, on April 15. The failed coup became what many have called the worst foreign-policy decision of Kennedy’s administration. 1975: Khmer Rouge troops capture Phnom Penh and government forces surrender. The war between government troops and the communist insurgents had been raging since March 1970, when Lt. Gen. Lon Nol had ousted Prince Norodom Sihanouk in a bloodless coup and proclaimed the establishment of the Khmer Republic. Trump created OAWP by executive order in 2017 and later codified it when he signed the 2017 VA Accountability and Whistleblower Protection Act into law. The office was mostly celebrated, with advocates hopeful that the focus on the rights and protections for whistleblowers would reverse a culture infamous for intimidation and reprisal. That optimism has largely soured, however, leading to hotline tips to the inspector general and bipartisan scrutiny from Congress. “There has been considerable interest by some members of Congress and other stakeholders in this effort,” said Mike Nacincik, the IG spokesman, who said he could not comment further on ongoing work. Government Executive spoke to several VA employees who expressed frustration or anger toward OAWP, three of whom have already been interviewed by IG investigators. They described feeling betrayed or neglected by an office they believed was going to help them but ended up doing the opposite. They said they have shared information with the investigators, including documentation of alleged reprisal. “It’s a crooked system where literally the fox is guarding the hen house,” said Jay DeNofrio. DeNofrio, an administrative officer at a VA facility in Altoona, Pa., had prior experience as a whistleblower before OAWP was created—years ago, he disclosed information about a doctor he said was losing mental capacity and putting veterans at risk—so he thought he understood the investigative process that takes place after employees make disclosures to investigators. OAWP, however, was the first body he’d ever worked with that coordinated with VA headquarters to find blemishes on his own record after he reported wrongdoing, he said. Investigators questioned his coworkers, telling them DeNofrio does not “walk on water” just because he is a protected whistleblower and encouraged them to immediately report “any instances of poor behavior,” according to transcripts of those conversations obtained through records requests and provided to Government Executive. Dan Martin, a chief engineer at VA’s Northern Indiana Health Care System, said OAWP failed to protect him when his case came before it. Martin said in 2016 he discovered contracting violations related to a non-functioning water filtration system, but when he reported the problems to superiors he was stripped of his responsibilities and sent to work in an office without heat or air conditioning. The VA inspector general launched an investigation into the contracting practices, and asked Martin to surreptitiously record conversations with procurement officers, Martin said. It was not until OAWP got involved in the case that Martin’s supervisors became aware of that cooperation. When OAWP allegedly shared that information with leadership at his facility, Martin said his supervisors “had no choice but to shut me down” so he could no longer send recordings about the supervisors’ “very inappropriate relationships with contractors” to investigators in the OIG. Martin is also fighting his case through the Merit Systems Protection Board. During that process, VA’s Office of General Counsel came to Martin and his attorneys asking for certain information about the case. The attorneys representing Martin told the lawyers in the Office of General Counsel they would only hand the information over during discovery. Shortly after rejecting the request, Martin said, OAWP followed up to ask for the same information. “Some of them are so crooked they swallow nails and spit up corkscrews,” Martin said. The alleged collaboration between the Office of General Counsel and OAWP has troubled observers. Tom Devine, legal director at the Government Accountability Project, a whistleblower advocacy group, said his initial excitement about OAWP has been dampened by “structural developments,” including what he called veto power the department’s general counsel has over the whistleblower protection office. This would appear to be in violation of the 2017 law that permanently authorized OAWP, which prohibits the office from existing “as an element of the Office of General Counsel” and its leadership from reporting to OGC. Cashour said it was false to suggest that the Office of General Counsel exercises veto power over whistleblower claims, but acknowledged OAWP and OGC do coordinate. “OAWP has a collaborative working relationship with OGC, but OAWP retains final decision making authority on all OAWP matters,” Cashour said. Rebecca Jones, policy counsel at the Project on Government Oversight, said the office can likely not completely fix its issues while it remains an “internal clearinghouse” for whistleblowers rather than a truly independent office. Jones praised the IG for investigating the alleged retaliation. “I wish it hadn’t come to this,” she said. Devine praised some of OAWP’s early accomplishments, such as delaying VA’s disciplinary decisions that involved alleged reprisal and the hiring of high-profile whistleblower Brandon Coleman as a liaison between whistleblowers and the office. Coleman even established a mentoring program to help assist victims of retaliation, but it has since been shut down. A third VA employee, who requested anonymity to protect his ongoing cases, recently informed IG investigators about what he alleged is OAWP’s betrayal of trust and subsequent inactivity. The employee made an initial whistleblower disclosure in early 2017 that was bounced around to several offices within VA. He subsequently was removed from his position as a technician and is now relegated to “brain-dead work,” he said. He contacted OAWP about the alleged reprisal later that year. During his interactions with the whistleblower office, he turned over sensitive information about his hospital that a colleague had provided—the OAWP investigator was the only individual with whom he shared the information. Days later, the employee said, the colleague was “chewed out” by leaders at the facility for sharing the information. To the employee, it felt like OAWP had betrayed him, he told Government Executive. The employee said he then experienced 21 months of “radio silence.” He recently spoke with OIG about his negative experiences with OAWP. A few days later, the employee said he unexpectedly heard from the OAWP investigators. He said he is now “very, very cautious” in his interactions with OAWP. Tonya Van, formerly a doctor a VA facility in San Antonio, also became a whistleblower after disclosing to a supervisor that a doctor at her facility was giving incorrect diagnoses. She filed a complaint with OAWP after she alleged her supervisor made her work life so miserable she was forced to resign. But she quickly became disenchanted with the office due to lack of communication, she said. She tried to follow up with OAWP but never heard back. The office eventually closed out her case, though it later contacted her about opening a second investigation. She said she has “no idea” what the results of either investigation were. Van alleged that her supervisors’ reprisal against her took the form of accusations of using foul language in the workplace. Martin, the Northern Indiana employee, said he faced an investigation for similar accusations. Cashour, the VA spokesman, said OAWP does not provide “detailed information related to the specific outcome of an investigation to employees” due to privacy concerns. He added that the office has revised its policies to disclose more information to claimants, including when an investigation has been closed and if claims of retaliation were substantiated. Multiple VA employees criticized this practice, calling it counterintuitive that VA would claim privacy concerns over investigations that the employees themselves requested. In August 2018, however, when Van had an in-person interview with OAWP investigators, she and her attorney were still alleging retaliation by OAWP. While asking about Van’s allegations, an OAWP investigator told Van she could be penalized for violating a prior settlement with VA by asking a former colleague to write a recommendation. Her attorney said Deirdre Weiss, the OAWP employee, was ignoring the intent of that prior agreement. “The bottom line is that, as accountability investigators, where we see possible wrongdoing we cannot look the other way just because somebody is a complainant, okay,” said Weiss, according to a transcript of the proceedings. Last year, before his office formally launched an official investigation into the practices of OAWP, VA Inspector General Michael Missal became part of a public spat with then acting Secretary Peter O’Rourke over documents housed within the office. The IG requested access to information on the cases filed with OAWP, but O’Rourke refused to comply. They aired their grievances through a series of public letters, which included O’Rourke harshly reminding Missal that the IG served as the secretary’s subordinate. Congress ultimately intervened by emphasizing in a spending bill that the IG had the right to any and all documents it requested. O’Rourke had previously served as the first head of OAWP, a period in which many of the complaints against the office originated. Current VA Secretary Robert Wilkie reportedly asked O’Rourke to resign last year after determining he was doing little work as a senior advisor. OAWP is still a small office, employing just 96 workers—28 of whom are investigators—for a workforce of 380,000. Its employees receive standardized training in investigative techniques, both internally and from outside experts such as those at the Homeland Security Department and the Office of Special Counsel. The office is now headed by Tammy Bonzanto, who previously served as an investigator on the House Veterans Affairs Committee. Her tenure has received mixed reviews. DeNofrio, for example, is still concerned by what he calls her lack of transparency. Other observers are cautiously optimistic that her leadership could get the office back to its original mission. 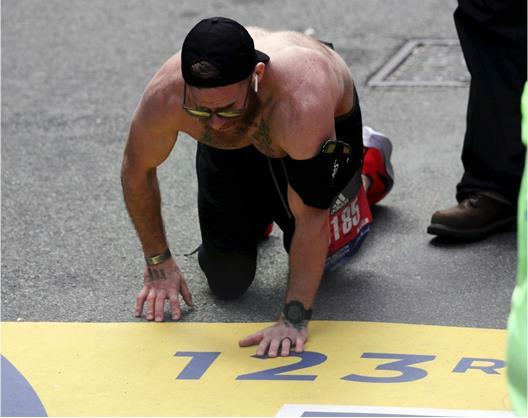 A viral video from Monday’s Boston Marathon shows Marine veteran Micah Herndon crawling across the finish line to complete his race after suffering from severe leg cramps. The 31-year-old Marine vet told the Record-Courierthat he entered the Boston Marathon in honor of three comrades who lost their lives in an IED explosion in Afghanistan in 2010. It was an IED explosion he survived. A veteran of the wars in Iraq and Afghanistan, Herndon deployed in 2010 to Marjah, Afghanistan, with the “Lava Dogs,” a nickname for 1st Battalion, 3rd Marines, headquartered out of Hawaii, the Record-Courier reported. During that deployment, Herndon’s unit struck three IEDs, the first one claimed the lives of two friends Mark Juarez and Matthew Ballard, and a British journalist Rupert Hamer, according to the Record-Courier. The third strike tore through Herndon’s Mine-Resistant Ambush Protected vehicle, launching him from the the gunner’s turret and knocking him unconscious, the Record-Courier reported. Herndon said he now finds solace in running. “I went from being in a war zone one day to trying to live a normal life the next day. We were going on three or more missions a day, constantly on guard and when I got back home, I was still in that mode. I never will be able to get over it, I don’t think, but I am coping. I am trying to get rid of the demons," Herndon told the Record-Courier. During the race, Herndon wore the names of the three who lost their lives in the Afghanistan IED blast on the his shoes, according to a Facebook photo. According to race statistics, Herndon completed the Boston Marathon in three hours and 38 minutes and finished 11,334 overall. Trump said the measure was unnecessary because, except for counterterrorism operations against Islamic State militants and al-Qaida in the Arabian Peninsula, the United States is not engaged in hostilities in or affecting Yemen. He said there are no U.S. military personnel in Yemen accompanying the Saudi-led coalition fighting Iran-backed Houthis, although he acknowledged that the U.S. has provided limited support to the coalition, including intelligence sharing, logistics support and — until recently — in-flight refueling of non-U.S. aircraft. "Houthis, supported by Iran, have used missiles, armed drones and explosive boats to attack civilian and military targets in those coalition countries, including areas frequented by American citizens, such as the airport in Riyadh, Saudi Arabia," Trump said. "In addition, the conflict in Yemen represents a ‘cheap’ and inexpensive way for Iran to cause trouble for the United States and for our ally, Saudi Arabia." House Speaker Nancy Pelosi issued a statement Tuesday night saying: "The conflict in Yemen is a horrific humanitarian crisis that challenges the conscience of the entire world. Yet the president has cynically chosen to contravene a bipartisan, bicameral vote of the Congress and perpetuate America’s shameful involvement in this heartbreaking crisis." Sen. Tim Kaine, D-Va., said Trump’s veto "shows the world he is determined to keep aiding a Saudi-backed war that has killed thousands of civilians and pushed millions more to the brink of starvation." "I hope my colleagues will show we won’t tolerate the Trump administration’s deference to Saudi Arabia at the expense of American security interests by voting to override this veto," Kaine said. David Miliband, president of the International Rescue Committee, a humanitarian aid group, said, "This veto by President Trump is morally wrong and strategically wrongheaded. It sets back the hopes for respite for the Yemeni people, and leaves the U.S. upholding a failed strategy." Trump issued his first veto last month on legislation related to immigration. Trump had declared a national emergency so he could use more money to construct a border wall. Congress voted to block the emergency declaration, and the president vetoed that measure. The U.S. move aims at "thwarting Iran’s influence," and shows that America’s longstanding sanctions against Iran have become ineffective, Hatami told lawmakers.